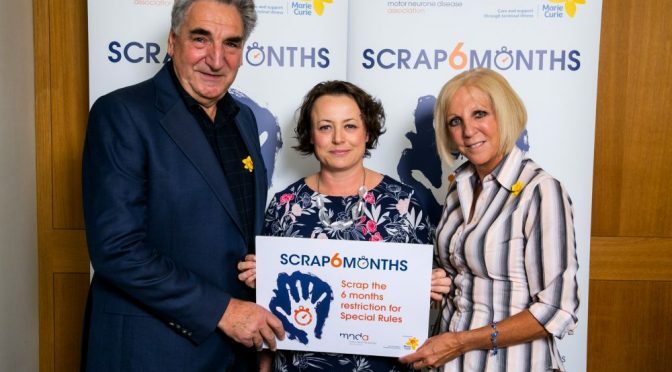 Newcastle North MP, Catherine McKinnell, has joined forces with actors Jim Carter and Nichola McAuliffe to back the ‘scrap 6 months’ campaign that will enable more terminally ill people to access benefits more quickly and easily, regardless of the condition they have. Currently, someone is only considered terminally ill if there is a reasonable expectation of having six or less months left to live. This outdated definition excludes people with complex and unpredictable terminal conditions from accessing the financial support they need in a timely manner, as the bureaucratic process for accessing crucial benefits can be lengthy and complex for those who need support but don’t meet the six months threshold. The charities MND Association and Marie Curie are therefore working together to push for a change in the law that would enable more terminally ill people to get quicker access to the benefits they need to live well until they die. The proposed change in the law – being introduced in Parliament by Catherine’s colleague Madeleine Moon MP – would allow clinicians to determine whether a person is terminally ill, instead of an arbitrary time-limit decided in years gone-by. This would mean that people with complex and unpredictable terminal illnesses, such as motor neurone disease, can apply for benefits in a way far better suited to their needs and circumstances. Madeleine Moon MP’s Access to Welfare (Terminal Illness Definition) Bill seeks to change the current definition of terminal illness to allow terminally ill people to access benefits quicker, easier, and in a way that best suits the individual. ‘Having the support of Catherine and Jim and Nichola makes a huge difference to the campaign.